A delightful twist on the standard race around the board theme. Tornado adds spice with twisters that throw players across the board. 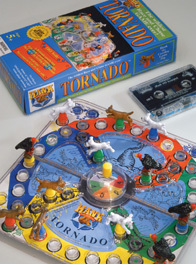 Based on best-selling children's author John Erickson's "Hank the Cowdog", game includes an audio tape of the story of Hank the Cowdog and his friends.